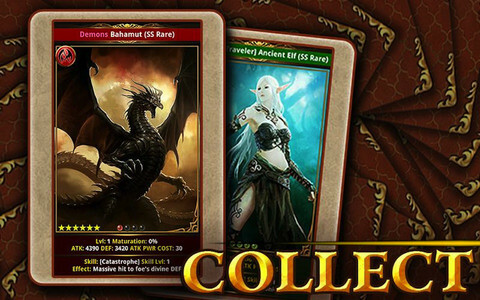 We check out Mobage's chart-topping card game. 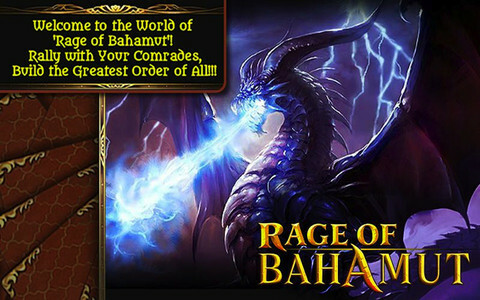 Rage of Bahamut is a peculiar game, there's no doubt about it. At first glance, you'll assume it to be a rather cheap & cynical browser game, dripping with demands on your wallet: buy dusts to continue battling, wait for agonizingly long timers to expire before continuing your quests, buy magical snake-oil to heal yourself back into battle. It's true that those options are there, but we're relieved to say that for the most part, they remain exactly that: options. A card-based battler, in Bahamut you choose a leader from your deck of cards and then level it up by completing quests. These quests are simple affairs where you tap on the screen and monsters die rather agreeably, taking out some of your health and stamina in the process. As you continue doing battle your stamina decreases, and you'll need to wait a while before you can continue. That is of course unless you buy some curing water from the App Store, or use one of the ones you've collected. The questing really isn't all that much to write home about, although it's the lure of increasingly powerful cards that will keep you coming back for more. You'll also pick up experience points and a healthy chunk of the game's currency as you dispatch the grisly but beautifully drawn enemies. You'll find yourself with duplicated cards early on, but rather than having them waste a slot in the deck, you can send them to the great bonfire in the sky in order to evolve the original card, a sacrifice which gives a permanent and hefty boost to the warrior left behind. Assuming you can overlook the rather depressingly adolescent, titillating poses of the female characters, you're going to enjoy gathering and enhancing every card you can get your hands on because the meat of the game is in the multiplayer. Taking the fight to the multiplayer battlefield is extremely addictive, with even more goodies to be unceremoniously nicked from your opponents in a game that currently has a thriving, active community. If you really want to throw yourself wholeheartedly into the game, you can join an Order (a sort of guild) and team up with like-minded players. Of course to do that, you'll need to find the option that lurks somewhere in the interface. Here's where things fall down rather ignominiously for Rage of Bahamut: this is one seriously ugly interface which should turn anyone with sense away from the game at a moment's glance. At every point of the game you'll need to scroll down an information overload in order to see what you currently wish to read, and continue reading. Everything's crafted from those awful advertising wire-frames that the internet left behind around the year 2000. It's horribly cluttered and certainly no game has ever looked uglier when scaling the iPhone-only client up onto the iPad. 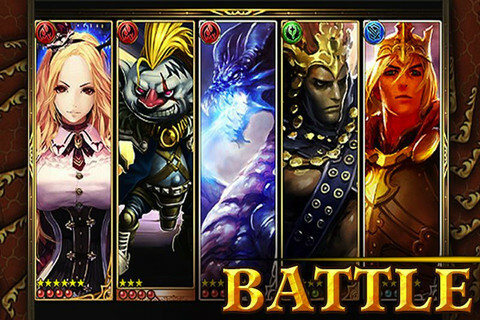 I don't quite know what's made Rage of Bahamut quite the phenomenon that it is, topping the app store charts and throwing a sucker-punch at its competitors in the process, but for all of its faults it is still a tremendously addictive game. It's also graceful enough to be supported with a freemium service that doesn't hang you out to dry if you choose not to take part. We can only hope that some revisions to the interface (along with much-needed native tablet clients) are planned for a future update. What's Hot: Addictive gameplay, not at all heavy on the freemium pressure, and the multiplayer mode gives the game endless potential. What's Not: Weak questing. Card design aside, this is quite honestly one of the ugliest games you will ever play. As well as the aesthetics, the interface is poorly designed and confusing.